"Many People wonder how a single exercise without movement could produce results comparable or even superior to an exercise with movement.....Only one or two seconds are required to take a curl from thigh level to chin height. The hardest part of the curl is not the start or finish, but instead the middle of the curl,where leverage causes the greatest effort. Yet the muscles are in that position for only a fraction of a second. With isometric contraction, the muscles would be exerting full force in this position for up to 12 seconds, so theoretically, one effort here could build as much strength as more than a dozen repetitions performed in the conventional fashion." "Bruce Lee. The Art Of Expressing the Human body." This quote should bring us all pause. The immortal Bruce Lee, saying that one repetition performed isometrically can do as much as 12 reps of conventional strength training! And do you know what- he’s right! In my opinion, the core of every single exercise regimen should be doing isometrics- tense the entire body, gradually, from calfs to neck- hold this tension for 6–8 seconds, and then relax. Repeat, 5-6 times seems ideal. Breathe freely while you hold your “most muscular” pose, but really tense those muscles! This will take about 1 minute, 2 at the most! Repeat a few times during the day, and you are doing more good for your musculature than hours of lifting weights. Really! Isometrics done in such a manner have been documented to be wonderfully effective in lowering blood pressure, for one vital reason to do them. But, it also builds strength, and not just in the muscles, but in the tendons and ligaments. It all depends on the amount of tension your give the exercise, but if you flex hard, your body will be stimulated to develop your musculature to a great degree- especially in the form of extreme definition. Your muscles will seem to stand out markedly beneath the skin, making them very visible. The next step? Do isometrics. but do them while you are moving. How? Let’s say you are doing a curl. Do it slowly, flexing hard as you curl, supplying the resistance from within. This is moving isometrics. Continue for, oh, seven reps. Remember, this is all without any weights. This will tax your biceps far more than a barbell or dumbbells would! Why? Because there is no momentum, no leverage variance in the amount of effort. As Bruce Lee alluded to above, in this case you are working to your utmost ability throughout every part of every repetition you do! The result? Maximum results, in the minimum of time. Now, just repeat this cycle of moving isometrics, or Perfectly Paleo Exercise on a daily basis. Add in barefoot sprinting and/or walking, a paleo type of diet, ample sleep and good sun exposure, stretching, and ideally some heavy hand walking as well. You will be so healthy and fit! To really immerse yourself in the ideas, and to figure out just how exactly to implement this type of exercise into your life, go to www.paleojay.com and read, read, and read. 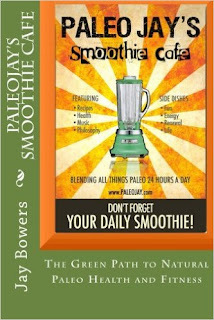 Or, just get PaleoJay’s Smoothie Cafe in paperback on Amazon, or the ebook Perfectly Paleo Exercise on iTunes, or anywhere else, and be easily guided into transforming your health and exercise! Easy Peasy!